In the comments to a previous post, Mark Harden raises the specter of Jimmy Carter as the low point in presidential office holders of the modern era. He even goes on to accuse the former president of treason for his post-presidential peacekeeping activities. Jimmy Carter’s record of unmitigated failure as president is completely unassailable. Even I could do no worse. His post-presidential treasonous acts make Carter even more reprehensible, by the way. Where did that come from, I wondered. How could a guy who has done so much to advance the cause of human rights and alleviate human suffering become so despised? Even winning the Nobel Peace Prize in 2002 seems to have just stoked the flames of resentment against this elder statesman. ...the sanctimonious, grasping Carter (who had shamelessly campaigned for the prize for years) accepted the prize under those stated conditions...in effect, spitting on his own country. Then my friend Libertas weighs in with his own denunciation of Carter (and every other president dating back to LBJ). 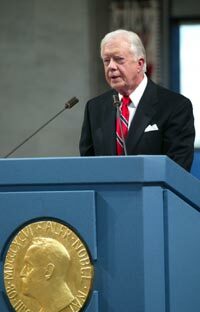 Jimmy Carter sold himself as a peanut farmer while actually a nuclear physicist. He was a hypocritical snob, sadistically hard on the help and totally incompetent at domestic and foreign policy, all Arafat, Sadat and Zion improv theatre not withstanding. At least Sadat not withstanding. But Ayatollah Khomeini on the rise. As for his treason, it is mostly against other nations whose rigged elections he habitually certifies with his cosmetic auspices. But the canal he “returned” to the Panamanians was ”leased” to the Chinese under Slick Willie. To help me understand where all this animosity is coming from, Mark pointed me first to a new book just out that calls Carter Our Worst Ex-President. And then to an article in National Review that levels a vicious and rather offensive tirade against Carter. I went ahead and read the anti-Carter screed by National Review managing editor Jay Nordlinger in an effort to try and understand what’s going on here, but I just came away disgusted by the piece. Nordlinger’s prose is like a stinking pile of dung deposited on the pages of National Review. The fact that they would publish this crap and continue to employ such a person says a lot about the integrity (or lack thereof) of that publication. I’ve got Carter on my mind, so look out. Why Carter? Didn’t he leave office in 1981 (the same day the mullahs decided to spring the hostages, lest RR send a few up their gazoo)? Yes, but he’s back in the news, yapping absurdly about the Middle East and getting ready to visit Castro down in Cuba (May 12 to May 17). Lest RR send a few up their gazoo?? I assume he is talking about missiles, but as everyone knows now Reagan did send the mullahs a bunch of missiles. Only they weren’t directed at anyone’s gazoo. They were instead neatly gift-wrapped and delivered along with an autographed Bible and a chocolate cake. the Haiti situation that did indeed irk many folks at the time. However, he notes that the end result were good. The bottom line was: There was no bloodshed. The elected, legitimate president of Haiti, Jean-Bertrand Aristide, was restored, the killings and human rights violations were stopped, Cedras and his pals ended up leaving the country, and Haiti now has a better chance than anyone thought possible to become a relatively normal country instead of a nightmare of death and cruelty. But back to Nordlinger, I doubt seriously that Carter used the term “thwart the Bush administration” in his letter to the Security Council, although I don’t doubt it did not square with the message being put out at the time by the Bush administration. Looking back now, however, I think most people would agree that it would have been best had Bush and Co. been thwarted. Not that I would like to have seen Saddam Hussein remain in power, but the costs in blood and treasure to our nation have far exceeded any meager threat the Iraqi regime posed even if they did have a musty stockpile of chemical or biological agents buried somewhere. Nordlinger goes on to dismiss Carter’s crowning achievements at Camp David in one paragraph without referencing any supporting material other than one unidentified academic’s offhanded remark on the Charlie Rose show. Carter enjoyed it in a truly unseemly fashion, grinning and grinning, seeming to draw his very life from it. It was perfectly human — perfectly natural — but obscene in a way. I felt almost as though I had to look away: like I was seeing something too private, something I wasn’t meant to see. What the hell?!? Where did Nordlinger come up with that? It sounds like he has an unhealthy obsession about Carter and tends to fantasize about what he might be thinking at odd moments. It’s really strange. But finally we get to the heart of the piece and I at long last discover what it is about Carter that is bugging not just Nordlinger, but my friend Mark Harden as well. You see, according to Nordlinger, Carter is “passionately anti-Israel.” The evidence for this? Well, the Carter Center gets a lot of funding from Arabs, for one thing, and Carter is known to be friendly with many Arab leaders. Nevermind the fact that George W. Bush and family also have recieved considerable financial backing from Arab leaders and have maintained a long and close friendship with many of the most influential people in the Middle East. For some reason, Bush is not accused of being anti-Israel. So what else did Carter do to attract this particular smear? In the 1990s, Carter became quite close to Yasser Arafat. Ah, that explains everything. You see, in the view of most right-wingers, Arafat was the epitome of all that is evil and the Palestinian people aren’t much better. Meanwhile, Israel is all light and goodness and can do no wrong. So if you are trying to negotiate a peace settlement between these two groups, you have to take Israel’s side 100 percent of the time or you are in league with the terrorists. The fact that you may support Israel, but disagree with policies put forward by the right-wing Likud government is a distinction that some people refuse to make. So the rest of the article just veers back and forth on these themes, taking cheap shots and making the same arguments over and over again. Very tiresome. For me, Carter is a great man and a great ex-president. He may not have had the best four-year run while in office, but as Mark Schmitt notes he might have done better in another time when his moral leadership would have made a positive difference. Bush had another press conference today? Good grief! It’s either feast or famine with this guy. Has this become a new addition to his permanent everyday schedule? Speaking of Iraq, here is an excellent timeline compiled by the folks at Think Progress. BAGHDAD, March 20 -- By almost any standard, Bashar Muhammed, the owner of a thriving Internet cafe, is a Baghdad success story. Three years after the United States invaded Iraq and overthrew Saddam Hussein, the Internet business here is booming, and Muhammed has what most Iraqis could only dream of under Hussein -- freedom, a cutting-edge job, lots of customers. But when conversation turns to his life and prospects, he sighs and voices frustration that Americans just don't get it. "It is true that we got freedom after the war, but uncontrolled freedom -- chaos and violence," he said in a cool, deliberate tone. Five of his relatives have been killed in car bombings and assassinations, Muhammed said, noting that most recently an uncle was killed for being a Sunni Arab. "The new generation is growing on violence and sectarian ethics, and this will affect Iraq for many years to come," he said. "We are living a more devastating war every day." Three years of upbeat White House assessments about Iraq that turned out to be premature, incomplete or plain wrong are complicating President Bush's efforts to restore public faith in the military operation and his presidency, according to pollsters and Republican lawmakers and strategists. I never thought I’d see the day when liberals would be vigorously defending Ronald Reagan, but that is just what we have now in the ongoing discussions of whether George W. Bush is the Worst. President. Ever. I have to agree with Schmitt and Marshall, Reagan was a far better president than Bush. GW will one day take his place in the pantheon of really bad presidents such as Grant, Buchanan, Harding, Coolidge, (Andrew) Johnson, Pierce and so on. While some would argue that he has still not sunk to the level of Buchanan or Grant, I think there is no question that he is the worst president of the 20th and 21st Centuries.